A few months ago I was scouring the Net for advice on how to compile my own football odds and by fate, I happened to stumble across a great little site called www.soccerwidow.com. Being impressed with the information they made freely available I decided to donate a few pounds as a ‘thank you’ for all the pointers and assistance I had received. The ‘Soccer Widow’ then emailed me to show appreciation for the donation and we went on to exchange a few emails. Eventually she mentioned that the ‘true odds and value detector spreadsheet‘ she had developed might be the answer to the problem I had in identifying value. You see, I am a football trader not a football bettor, so I’m not really worried about the exact outcome of games as I’m purely looking to make a profit by taking advantage of the odds moving in my favour. At some point in a match I will hopefully trade out for a profit but sometimes, I have to trade out (not too often!) to minimise a loss. So, with the advice Soccerwidow provides on her Web site in mind, I began looking for trading opportunities using my findings from the very scientific spreadsheet she offers. As a result, this series of articles is going to be my own personal Soccerwidow blog/diary. 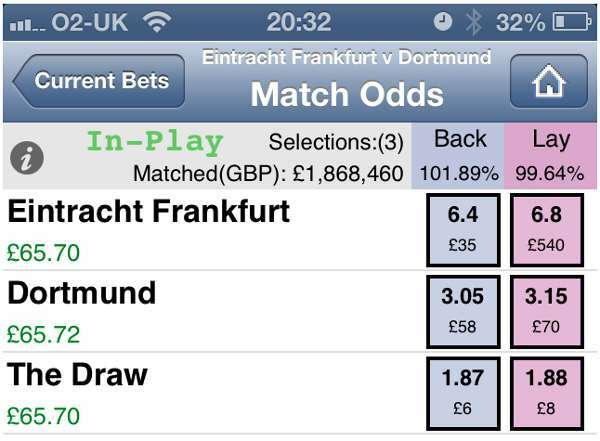 I take this information in but I’m looking for real value and don’t really want to lay Dortmund to win the game at 1.87. As luck would have it, as the match goes ‘in-play’ I don’t have to wait too long for the ‘value’ to arrive as Dortmund go 0-1 up in the 24th minute, and now my concept of a value trade has been handed to me in the way of laying Dortmund at their new price of 1.3 to win. Just four minutes later Dortmund do their utmost best to spoil my evening by going 0-2 up and they are now trading at just 1.08. My low liability lay of 1.3 looks dead and buried, but thankfully Frankfurt haven’t read the script and two quick goals at the start of the second half ties the match once again. I’m now ‘happy as Larry’ or ‘over the moon’ or whatever other football cliché you wish to use, because I’m now just waiting those few vital seconds for the markets to settle so I can GREEN UP. Before I can do so, Dortmund literally stick a knife in my heart and score their third of the evening to re-take the lead! Now, at this point I’m not too upset as time is on my side with over 35 minutes left plus stoppage time and Frankfurt are still quite buoyant, playing well and they’ve won their previous four league matches. This is just one of the few methods I’ve been using since following the Soccerwidow; I will be using others which I will post in the fullness of time. I am sure there will be losers along the way but hopefully the winners will more than compensate for them. I will be looking to back ‘Under 3.5 Goals’ in-play if there is a goal within the first 30 minutes and hopefully trade out when the opportunity arises. Yesterday’s good work was undone by three first half goals in the Moenchengladbach v Hamburg game, and with the away side taking the lead twice I decided to exit at half-time for a loss. I had entered the ‘Under 3.5 Goals’ market @ 1.69 after the first goal was scored (the Widow’s ‘zero’ odds being 1.3) and was tempted to green-up for approximately £18.00 just before the home side headed in to make it one-all. So, onto the next game in my hunt for ‘value’ as I am sure there will be plenty of winners on this journey. Thank you for sharing information! I hope to see you more here. and i like soccer. Hello. Nice stuff you have posted. On the Man. 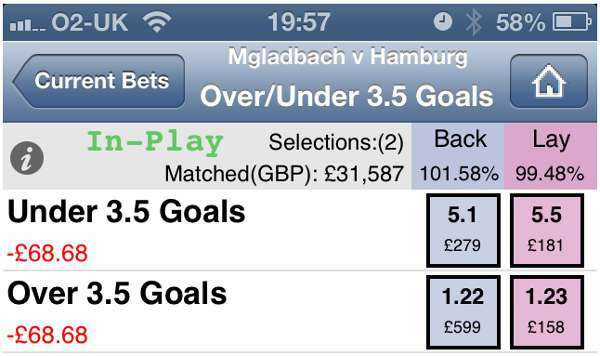 City game good trading….well, same goes for the Bayern Munich game, although the “lay underdog” would be a poison. I had that Bayern game (BATE ?) in a multiple. Guess who spoiled it…. I like your way of seing the “game”. In a certain way, I do think alike. True odds exist when the ball starts rolling, and clear opportunities arise “in-game”, specially if you can watch it live. One can do bets against expectations (pre game) or trade those expections during the game itself. Yesterday no good games where on…I picked Sabadell vs Hercules…the underdog scored first, I layed, scores again …..dam ! Sabadell should have at least drawn it, but they were unfortunate. I used CS to minimze damages. End mentioning the fact that Marathonbet and another one that belongs to same group have (???) amazing odds, but just on the screen. You soon realize that you cannot trade them as you wish in the first place, so one should not even consider their quotes. (this commentary is related to Widow’s post on the overround calculations).